After a successful first leg (despite the weather confining the ship to the Moray Firth for several days), the second leg of the RV Poseidon cruise, led by GEOMAR, set sail from Bremerhaven. 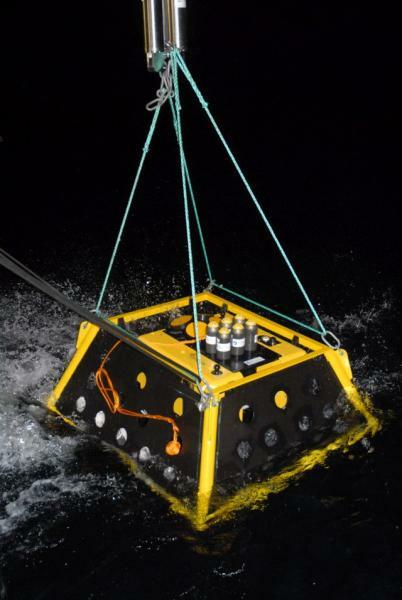 On 16th October, the seabed lander was deployed on the seafloor via acoustic release. Interrogation via acoustic modem confirmed that all functions of the lander were working correctly. The lander was built by Develogic and is equipped with commercial instruments (upward looking ADCP1, a Seabird CTD2, hydrophones and Deep SeapHOx3) as well as lab on chip sensors developed at the National Oceanographic Centre to measure nitrate, phosphate and pH. The lander will remain in place, collecting environmental baseline data until the main experiment cruise in 2019. It will be recovered briefly during a cruise in August 2018 to exchange batteries and carry out routine servicing. In addition to the long-term lander, two other short-term landers were deployed via video-guidance, next to the main lander, for additional experiments and measurements. These landers will be recovered during the present cruise.